my name is Bruce and i rescued my GSD coby. as a puppy he was abused. they tried to crop his tail twice know it is at a odd angle and he started having hip problems know its like he is a totally different dog. he cant jump or even run he is also losing the fur on his back but that just means we love him more and more thank you for reading. Bruce, Thank you so much for sharing your great story about rescuing your new little German Shepherd puppy Coby from that abusive situation. I just don't understand people and why they keep doing such crazy things to animals - and I don't think I ever will. What a wonderful story but I’m so sorry hearing about all the circumstances that lead up to the adoption. Poor Coby! I hope you’re both doing much better right now. And I’m sure Coby is so much happier in your care than where he was before. There’s nothing like a new German Shepherd puppy to help you pick up your spirits - good for you for saving that puppy. You both are special! Thank God you have each other. Take care. 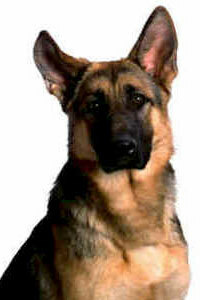 I just wanted to say that you have a heart of gold to rescue a GSD puppy who was abused and who needed love the most. I wish you and Coby the best. God bless you both.